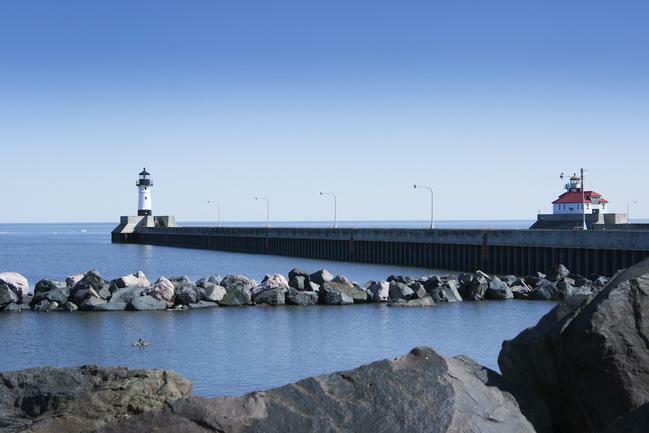 Located in Cook County, Grand Marais is a city that is about as unique as its name – not to mention tight-knit! In fact, as of the 2010 Census, this community had a population of just 1,351 residents. The community was appropriately named as such because there was a marsh in the community that, during early fur-trading times, was actually 20 acres. Located at the head of a small bay and harbor in the area, it was a landmark for early settlers. Another interesting tidbit: There’s a small bay on the east that is less protected from storms in this community. It is separated from the harbor by a slight projecting point as well as a short beach. This created the allusion of two bays for early inhabitants, which is why the Ojibwe name for the area is Gichi-biitoobiig, which means “great duplicate water,” “parallel body of water” or “double body of water” (like a bayou). But Grand Marais is much easier to pronounce! This 2.9-square-mile community definitely seems to know how to pack a lot of fun into such a small area! After all, there are several festivals held here each summer. One is the Dragon Boat Festival, which is held during the last weekend in July. During this event, boasts shaped like dragons tour the water. Proceeds go to three North Shore non-profit organizations as a result, including WTIP Radio and the North House Folk School. Meanwhile, the Fisherman’s Picnic is held in Grand Marais during the first weekend in August. This event harkens back to the days when the area’s economy was based on logging and commercial fishing. During that era, the community would gather for a shoreline potluck picnic featuring a fish fry of fresh Lake Superior herring. This community also is home to a number of historic buildings as well, which is sure to impress the history buff in your family. Meanwhile, this community also boasts a treasure trove of outdoor recreation opportunities as well. See what we mean? There really is so much to do in such a little area! Meanwhile, there are some excellent public schools that serve residents living here. Thus, regardless of your preferences, you’re sure to find an excellent school for your children in the area. If this sounds like the kind of community that would complement your lifestyle well, then please contact us at Stutsman Realty Inc.
We would love the opportunity to assist you by answering all of your questions and also telling you about available Grand Marias real estate for sale. We’ll Get Your Grand Marais Home Sold! Make sure to also connect with us if you’re ready to list your current home on the market. We’ll walk you through every stage of the home selling process, starting with first determining your homes true value!